The first, little more than a suggestion, was in 1814, after the British burned Washington during the War of 1812 (for more on this you can check out my post on the selection of Columbus, KY as the new capital). The second challenge came about in 1846. The greater debate centered around whether Congress should retrocede Alexandria out of the District of Columbia and back to Virginia. At one point the debate shifted to whether the Government even could, let alone should, change the area of the capital. This, in turn, led to a broader discussion between Senators John C. Calhoun of South Carolina and William Allen of Ohio over whether the capital could be relocated. Calhoun referenced a trade convention he attended in Memphis the previous year, during which the idea of relocating the US capital somewhere west was discussed, only to have the idea laughed out of the hall. Allen retorts that the reason for that was not the notion of moving the seat of government, but rather the lack of a definitive location. While it may seem silly to us today (and perhaps to some even then) to talk of moving the capital, in the nineteenth century Washington DC was not a pleasant place. Built on a stretch of low ground and lacking modern drainage the city was frequently muddy, flooded, or just outright stunk. Ulysses S. Grant would write of the capital in 1870 that it was “a most unsightly place…disagreeable to pass through in summer in consequence of the dust arising from unpaved streets, and almost impassable in the winter from the mud.” As the nation expanded westward, representatives from those far-away states were becoming more and more irritated by the long trek to a muddy tidal plain. As you might guess, the movement to relocate the capital began in Congress as a counterpoint to spending bills which included significant amounts to clean up the District of Columbia. Beginning in December of 1867 with Rep. John A. Logan (Ill.) three resolutions were introduced into Congress with the aim of relocating the capital to the Mississippi Valley, rather than spend gross sums cleaning up what some viewed as a lost cause. The third such proposal finally came to a vote in 1868, with 77 for removal, 97 against, and 15 abstaining. While it was voted down, the number in favor was something of an eye-opener to representatives from the East (one of whom joked prior to the vote “…is not a part of New York and northern Pennsylvania in the valley of the Mississippi?”). 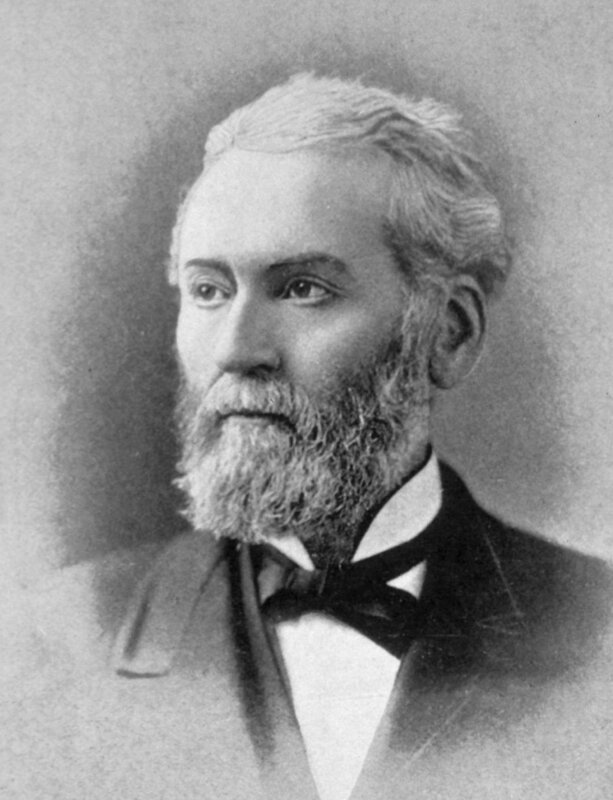 Outside of government, the movement got its first jump-start from Joseph Medill, editor of the Chicago Tribune. 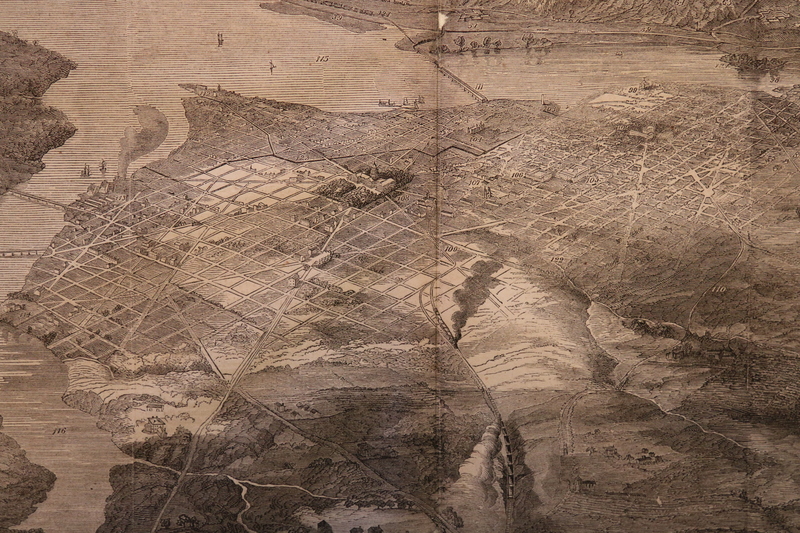 In an editorial published July 4, 1869, Medill not only laid out the logical reasons to move the capital to a more central location but also named St. Louis, MO as the ideal spot. While nearly universally condemned in the Eastern press, the idea took root in the Midwest, especially in St. Louis. Spear-headed by staunch St. Louis booster Logan Uriah Reavis, a committee was formed to call formally for a national convention to consider relocation of the national capital to the Mississippi Valley. Letting no grass grow under them, the committee, with Reavis as secretary, issued their formal call in the press and to each state’s governor on August 12. The convention was set for October 20. Reavis was something of a unique character (a picture of the man can be found here and will tell you almost as much about him as I can by writing about him!). According to James Neal Primm, in his work “Lion of the Valley”, Reavis was “an Illinois newspaperman who had hustled real estate in Falls City, Nebraska, before he bought the faltering St. Louis Daily Press in 1866.” The paper failed, but Reavis emerged with a vision of St. Louis as the beating heart of the nation, writing that St. Louis “cannot escape the magniﬁcence of its destiny. Greatness is the necessity of its position.” He had written a book on the subject in 1868 called “A Change of National Empire” detailing not only the arguments in favor of St. Louis, but also those against maintaining the current capital in Washington. Two years later he would follow this up with another volume “St. Louis: The Future Great City of the World”, written in equally ardent terms. Despite Reavis’ dogmatic enthusiasm, the reaction to a convention was decidedly lukewarm. Even the Chicago Tribune, the paper that first broached the idea, felt that the call for a convention through newspapers was rushed, and should have been preceded by a gathering of representative opinion on a more national scale. Despite this tepid response, acceptances did trickle in. When the convention opened that fall in St. Louis’ Mercantile Library Hall, representatives were present from twenty-one states and territories (although none from an Atlantic state). Over three days the St. Louis Capital Convention would pass eight articles, laying out the history behind their views and vowing to condemn any Congressional spending to improve Washington. While it did include a carriage tour of the city, a banquet, and a river excursion, the Convention didn’t accomplish much or generate significant national interest in relocation. However, the Convention’s call to block Federal appropriations for the improvement of Washington DC met with a little more success. Larger bills were blocked, although smaller ones still managed to pass. An effort to organize the resistance within Congress was led by Rep. Logan, but ultimately proved ineffective. In the meantime, Reavis had hit the trail to drum up support. Making a tour of the Northeast and penning numerous letters to the sympathetic New York Tribune, he called for a second convention, this one to be in Cincinnati. The Cincinnati Capital Removal Convention began on October 25, 1870, but if the response to the St. Louis Convention had been tepid, that to the Cincinnati Convention was downright frigid. As before, all states were asked to send delegates, but this time only seven actually did. And what of Logan U. Reavis, the charismatic, outspoken champion of a Midwest Capital? He would continue to champion his cause, despite his words falling on deaf ears. He would pen books on various topics before passing away in St. Louis, on April 19, 1889, at the age of 58. His son, Logan Uriah Reavis, Jr., a writer himself, would carry on his father’s work to a lesser extent, penning several opinions on the topic of capital removal for the New York Herald-Tribune as late as 1949. Cong. Globe, 29th Cong., 1st Session, 1046. 1846. Sioussat, George L. “Memphis as a Gateway to the West.” Tennessee Historical Magazine, Tennessee Historical Society. Vol.3, No.2. June, 1917: 77-114. Print. Cong. Globe, 40th Cong., 2nd Session, 209. 1867. Cong. Globe, 40th Cong., 2nd Session, 935. 1868. Cong. Globe, 40th Cong., 2nd Session, 1084-1085. 1868. Clark, Olynthus B. “The Bid of the West for the National Capital.” Proceedings of the Mississippi Valley Historical Association for the Year 1909-1910. Ed. Benjamin F. Shambaugh. Cedar Rapids: The Torch Press, 1911. 214-290. Print. “Lion of the Valley” James Neal Primm, James Neal. Lion of the Valley: St. Louis, Missouri, 1764-1980. St. Louis: Missouri Historical Society Press, 1981. Print. Reavis, L.U. A Change of National Empire; or Arguments in Favor of the Removal of the National Capital from Washington City to the Mississippi Valley. St. Louis: J.F. Torrey, 1869. Print. “The Capital Convention.” New York Times 22 October 1869: 1. Print. Cong. Globe, 41st Cong., 3rd Session, 1941. 1871. “Obituary- Logan Uriah Reavis.” New-York Tribune 27 April 1889: 7. Print. Reavis Jr., Logan Uriah. Letter. New York Herald-Tribune 27 February 1949, 12 June 1949. Print.